Reading the National Review's symposium on who was the greatest President of the United States, something immediatly strikes me, which is that the conservatives who write for the National Review seem to have formed their opinions out of a distaste for what happened in the 1970s. Its often and rightly argued that many of the politicians who maintained the consensus in the UK about economics through the 1950s and 1960s were motivated by seeing mass unemployment in the 1930s, perhaps though we need to stress more how much the vigour of conservatism in the United States and the United Kingdom proceeds out of a vision of the 1970s that they have as a low dishonest decade. 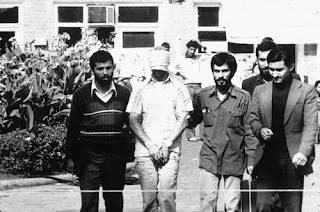 What's interesting is that for foreign policy the thirties still dominate as the decade that people on the right tend to align their policies against- there seems to be a vague sense that in the seventies the United States was weak allowing moments like the Iranian hostage crisis to happen (see picture above) but its appeasement which has become the convenient tool to close arguments rather than detente. I'm not so sure about the left- the British left has an anti-Thatcher thing going and its possible perhaps to see this last decade as something that the American left in particular mobilises against. The sense on the right about the seventies and thirties though is very strong and is a very interesting determiner of where the ideology is going. Yes, I've always thought that appeasement in the way Thatcher described it was misguided, for the world in the 30s and the world from the 70s on are two very different places. I thought it a flawed comparison. Btw, some of my recent reading has left me gobsmacked at how many of the British ruling and upper classes pre-WW2 were pro-Nazi. Gracchi, I'm going to respond to your post on my blog as I think that the process is rather more varied than that. Welshcakes, while the world of the 1930s and the world from the 1970s are very different places you have to remember that conservatives in general have a greater respect for enduring truths. One of those truths, of which the 1930s are used as an example, is that the the truly evil can rarely be bought off with compromise and must often be confronted. While references to the 1930s can lack subtlety they are still a useful reminder for the layman of something that is unlikely ever to change. As for the British ruling classes and the Nazis I think it's easy to confuse anecdote with trend. Matthew, thanks for your insight. Always willing to learn! I think you have a point about Conservatives having a greater respect for enduring truths and I was not for one minute suggesting that we should have appeased the Nazis. My reading was well-researched, by the way.